The growth of the accounting and bookkeeping industry in 2017 was simply immense. Subscriber numbers for QuickBooks Online hit 2.55 million worldwide in the first quarter alone, Xero made the move to the Australian stock exchange to expand their capacities, and Sage boosted their cloud offering with the acquisition of Intacct for $850 million. So what’s in the pipeline for the industry in 2018? 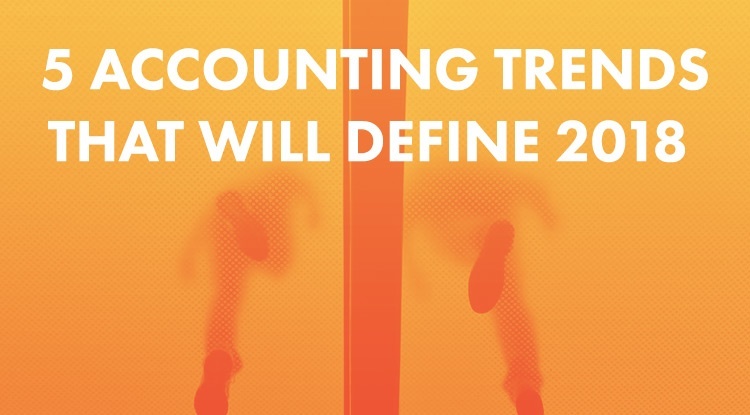 From a year of conferences, conversations with our partners, and some good old fashioned research and analysis, we’ve put together the five accounting trends that will define 2018. The McKinsey Institute’s October 2016 report Independent work: Choice, necessity, and the gig economy found that 162 million people across Europe at the US are currently engaged in ‘gig’ work, which counts for approximately 30% of their combined working populations. The Intuit 2020 Report predicts that this number is only due to rise, forecasting that freelancers will represent 43% of the workforce by 2020. The world of self-employment can be a tricky one to navigate, as there is no longer the simplicity of Pay-As-You-Earn tax or tax withholding. On top of that is navigating the expense claim process – for many, these are daunting prospects. However, the scale of this market, and the potential untaxed revenues, mean that tax authorities can’t ignore it. As an accountant, you can and should take advantage of this. Workers who have previously had their tax obligations covered by their employer will suddenly have to to manage their own affairs. Make sure that you have systems in place for self-employed clients, such as tax self-assessment apps and learning materials so you can offer a price point commensurate with income from a side-job. You may also want to think about targeted marketing for self-employed clients – perhaps a blog post about your specialised services for self-employed clients, or an e-book on which expenses are allowable to claim. Either way, current accounting trends show that there will be a lucrative market for those who can adapt their service offering to this growing workforce. Australia made the move to a digital tax system long ago, but it’s taken a long time for the rest of the world to catch up. Making Tax Digital was meant to come into effect in the UK in April of 2018, but due to the negative response from businesses, HMRC pushed this back by a year. Although the deadline for VAT-registered business is now April 2019, the process of migrating your clients should definitely begin this year. Spring 2018 will see the new system rolled out to a test group, followed by a wider release. Meanwhile in the US, Inland Revenue Services recently released their 2017 Digital Services report which details a number of recommendations for Congress, including implementing online tax accounts and developing APIs to better engage with third-party softwares. The IRS already offers online accounts for individual taxpayer, but this report suggests that the US may be going digital in the not-so-distant future. Your role in this time of change is simple: try to stay as up-to-date as possible with any changes and educate yourself on new legislation before it comes into effect. In this way, you can be a reliable fountain of knowledge for you clients as familiar systems become unfamiliar. You can also use that knowledge in advisory services, to add extra value for your clients. This year saw the release of accounting and bookkeeping products and updates which pushed the boundaries of what we previously thought possible – Sage’s chatbot Pegg, Xero Discuss, Quickbooks’ Assistant for SMEs, the list goes on. According to current accounting and financial trends, chatbots seem to be steadily moving into the mainstream, with banks such as Capital One and Bank of America pitching in with their own iterations. PwC predicts a big uptick in robo-advisors over the next year or so, as well as the move from automation into “cognification” – which sees machines make much more specific decisions. As their presence becomes more routine in our lives, handling more of our our day-to-day admin, accountants and bookkeepers will be forced to redefine their role in their clients’ business lives and the value they add. The first step will be to embrace this new technology – trying to resist it will only results in falling behind in the race for ever-more efficient accounting. Those who thrive will be those who use these tools, and the attendant data power, to help their clients. This will require focusing on the skills that AI will never master – understanding your clients’ needs and goals – and using these tools to help them succeed. data-processing AI and business owners, but only if they keep up with the changes that accounting trends are bringing. As of May 2018, the General Data Protection Regulation (GDPR) will be effective, an EU-wide ruling which essentially holds organisations accountable for the information they have in their possession. In view of the data breaches that have been happening all over the world this year – including a huge attack on Paypal’s system announced only days ago – it’s only natural that big data and data security is at the forefront of consumer consciousness. If you’re based in Europe or the UK, the first step is of course ensuring that you are GDPR-ready (this self-assessment tool is pretty useful). Even if you are based elsewhere, it’s important to remember that as accountants and bookkeepers, you have access to sensitive information which needs to be appropriately protected. An essential part of good client experience is providing your clients with peace of mind, and knowing that their financial data is safe and sound contributes substantially to that peace. In 2018, investing in trusted security software can and will be a key differentiator for your firm, so you should begin researching your options – Mimecast and Symantec are good places to start. As previously mentioned, this year Intuit released Quickbooks Assistant – essentially a virtual accountant for SMEs. The release follows a general trend in accounting tools of becoming ever simpler to use, especially DIY softwares. In fact, according to Xero, 59% of SMEs believe that they will not need an accountant in 10 years’ time. This means that accountants will need to redefine their role in a client’s business. Even if your clients are able to take on more of the groundwork in managing their finances, issues such as forecasting and strategy will still come up as roadblocks. The unfortunate truth is that 72% of businesses go under due to the lack of well-developed business plan. That’s where you come in: with an in-depth knowledge of accounting systems and the financial climate, you can provide the crucial advice that will help a client’s business thrive. Of course, there will still be clients that require the staple compliance and accounting services, but in 2018, client needs will trend towards an active role in your clients' success. It is essential that you have the toolkit to answer those needs. It’s never too early to start planning – factor these trends into your 2018 strategy and reap the rewards.